With National Poetry Day around the corner on the 4th October we are reminded that words can have the power to move us emotionally, get us through difficult times and hopefully inspire us to do great things. Whether it’s poetry, simple prose or song lyrics- I’m certain that we all have known words that move us forward. Whilst I never really connected with the somewhat stuffy classical texts that I was exposed to as a young person, I really did enjoy music that had lyrics that I could think about. In fact, it was my appreciation of artists like Bruce Springsteen who opened the way for me to appreciate poetry. Great linking requires pupils to reflect about their own identity as well as the diversity around them. We try get pupils to think deeply about how we should all live together with each other and be open about any barriers that we may face. Pupils, even from a young age understand that the world is not a perfect place and in fact some of the best and most logical ideas I’ve had on how we can solve issues around us have come from my pupils. However, to spur on deeper thought and reflection, we need a spark. This is where poetry can really come in. We have many poems we like to use including the inspired People Equal by James Berry and Where I’m From by George Ella Lyon. You can find resources for I am Poems on our website at https://thelinkingnetwork.org.uk/resource/working-through-poetry/and an audio of a great poem at https://thelinkingnetwork.org.uk/resource/i-i-year-4-class-poem. This summer we came across The Same Inside by Liz Brownlee, Matt Goodfellow and Roger Stevens (see illustration above). 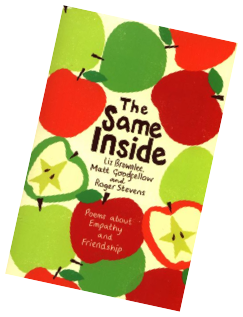 The book is an incredibly thoughtful collection of poems about relationships empathy and respect – and while it’s hard to pick a favourite as there are so many that are just perfect for the primary classroom.We are currently recommending Names, Puzzle, Together and The Same Inside everywhere we go on training for linking. We are just delighted that Matt Goodfellow has read two of his poems to camera for linking classes and sent us the video clips. For further ideas and resources, please click on our resources tab on the website. You might also want to have a look at the National Poetry Day site at https://nationalpoetryday.co.uk/which includes a fantastic recommendation for Karaoke Poetry – going to give that a whirl! Do get in touch to share your top suggestions for poetry for primary or secondary classrooms that you have found could move thinking forward on identity, diversity, community, equality.